When I started running, I didn’t really know what to wear. I thought just regular running clothes would do just fine, but was I wrong! The best types of clothing to wear when running, jogging, exercising, or just plain working out is clothing that absorbs and wicks away moisture, so when you sweat, your clothes doesn’t bring you down. 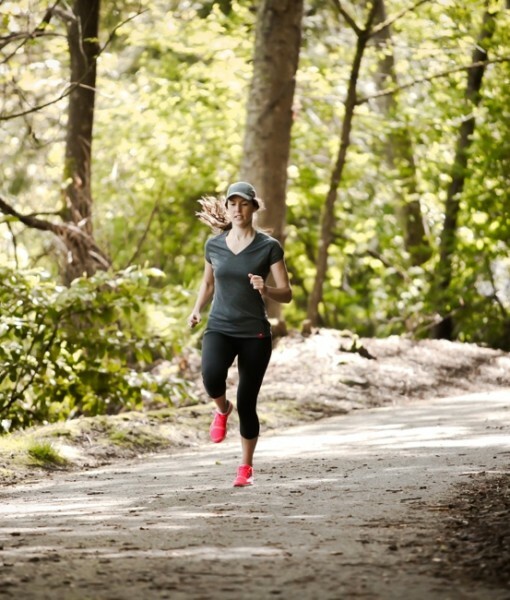 Running apparel includes sport leggings or spandex shorts, polyester shirts and tank tops that wick away moisture, and sports bras to hold your breasts in place, prevent them from sagging, and to help keep their shape while running. 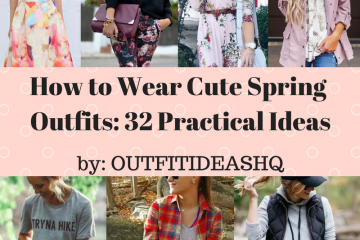 Here are 37 fun & cute running outfit ideas you can wear for stylish jogging fashion outside. Includes Nike and Adidas apparel. 1. This lady is wearing a white tank top, black sports shorts, and black and blue running shoes. The visor cap helps keep the sun from her eyes. Perfect running outfit for on the go. 2. A city design pattern Adidas running capris and a black long sleeve sports crop top shirt. This girl is ready to go! 3. Sometimes, you just wanna look simple and not too sporty. In that case, go with these Nike running shoes, bright yellow running shorts, and purple-blue long-sleeved sweater. Perfect outfit for running outside when it’s a bit chilly. 4. 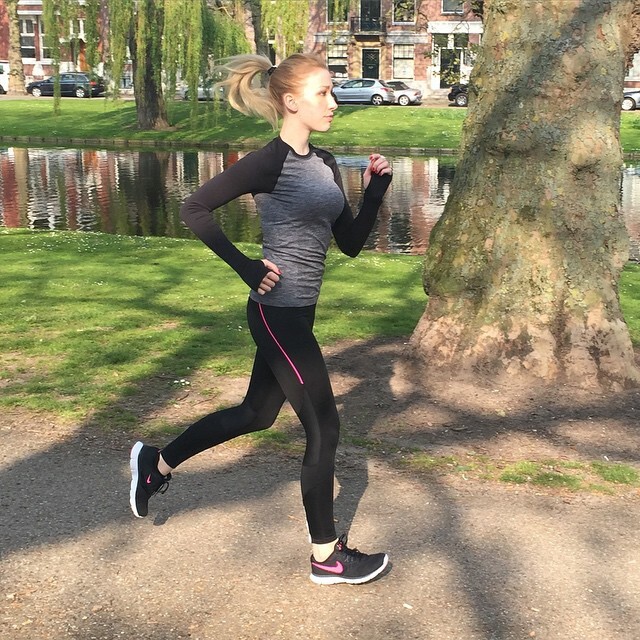 Now this is the running outfit to go to when it really is chilly outside! This winter outfit showcases a sports running hoodie, New Balance running shoes, Nike running leggings, and a pair of red headphones. Don’t forget to carry your fashionable water bottle! 5. There’s always something between a runner and her really bright clothing. This runner sports blue Nike legging capris and a bright neon yellow shirt that says “Run Happy”. So make sure you run happy. 6. This woman’s outfit includes a pair of purple Under Armour running shoes, black running shorts, and a slim fitted black tank top. This goes to show you don’t really need a lot of fancy things to wear when jogging. All you really need is clothing and apparel that will cover and help wick away sweat. 7. Black spandex shorts and a pink sports bra. That’s it. If you’re feeling risky or just don’t want the hassle of clothes, go real minimalistic. Don’t worry, it’s acceptable to wear these when working out. Just be sure you’re working hard and not just using this running outfit to show off. 8. Want to be a little bit more conservative with your outfit? Wear a gray tennis skirt and a cotton sweater. But to be honest, it will be better if you went with better material. But hey, if you really like this outfit, then go ahead! 9. Okay, so what about if it’s cold outside? 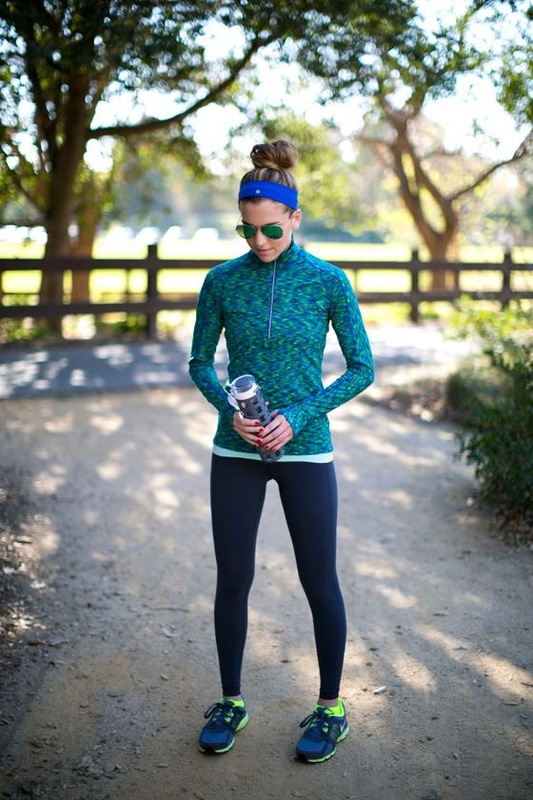 Here’s what you can wear: long tight sport leggings or yoga pants and a long sleeve running jacket. Complete the look with a running headband (sweatband). 10. This woman is wearing just a simple hat you can get anywhere and dark clothing. The red running shoes pop out in contrast with the outfit. When running, you always have to have at least one clothing item really bright. 11. What a beautiful scenery for running. Complete the look with an orange running shirt, blue running shorts, and a pair of Nike’s. 12. Super simple. Instead of wearing just spandex shorts and a sports bra, you can wear running capris and a sports bra. 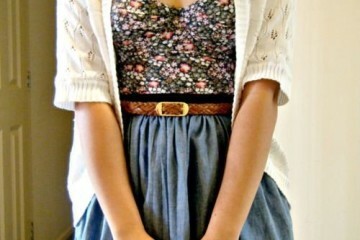 It adds more depth and balance to the outfit, so it doesn’t look like you’re revealing too much. 13. If you just want to go walking or a non-intensive run outside, feel free to go with a pair of tights and a simple hoodie sweater. 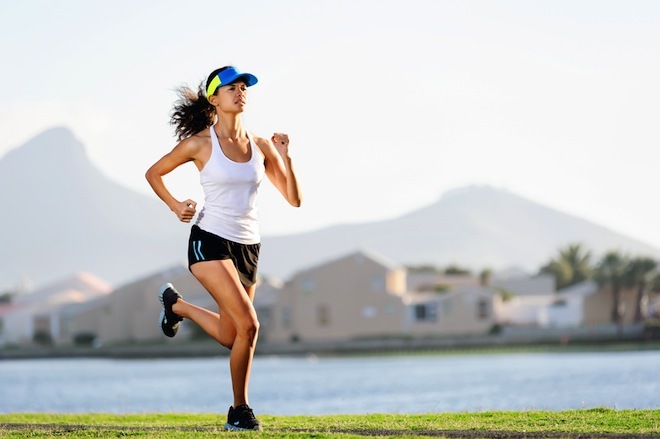 When running, clothing is almost always never restrictive, so don’t feel like you always have to wear something tight. 14. Same thing with this woman. Wear a pair of simple jogger pants, hoodie, and bright running shoes. 15. Here’s another example of someone wearing tight running shorts and a sports bra. This one looks more athletic, like she’s running for a team or something since there isn’t a ton of bright clothing. Don’t forget to complete the look with a sports wristwatch! 16. A purple running jacket, blue running shorts, and a pair of black and white sneakers for jogging. 17. Super slick looking here. Red Nike shoes, Nike running leggings, and Nike running jacket. All black and white. A sports watch to complete the outfit. 18. Pair of black running shorts, black tank top, and New Balance shoes. 19. Perfect running outfit for Fall weather. Nike black shoes, black with pink strip running leggings, and a dark colored sweater to keep from the chills. 20. Perfect for running in cold weather where you have a jacket to keep you warm when you start to cool off. Yellow Nike sports bra, black Nike shoes, Nike black capri pants, and a Nike black zipper jacket. 21. Super simple with orange Nike shoes, black capris, and a simple blue Nike running shirt. 22. This running outfit for women is perfect for cold, windy, or wet weather. Wear this in the winter or when it’s raining. Waterproof running pants, waterproof running jacket, and a sweatband to keep you and your ears protected from the rain. 23. A blue zipper sports jacket, black running capris, and black running shoes. 24. New Balance running shoes, black shorts, and a grey moisture wicking t-shirt. 25. Bite this! A white tee, black spandex shorts, and orange Nike’s. Don’t forget your earphones! 26. Black running shoes, black capris, and a purple running tank top. 27. Pink headband, running capris, and a white sweater with bright neon pink sports bra. 28. Pink shorts, running shoes, white T, and a blue tank top. Nice layered look for running or jogging outside. 29. Black and pink running capris and a bright neon pink colored sports bra with straps. 30. An orange tank top, black sportswatch, and running shorts completes this look. Don’t forget to add the white cap! 31. White shorts, white sports bra, and a blue Nike mesh shirt if you’re feeling too insecure with your stomach. An Apple watch to top it all off. 32. A fancy green running outfit. This girl is wearing green sneakers, grey shorts, and a fancy back sports bra with a long sleeve sweater. 33. Sporty yet preppy. Black and white striped cami tee, Nike spandex shorts, and bright yellow neon running shoes. 34. Nike shorts and a gray t-shirt. Sometimes it’s okay to just be simple. Wear this fashionable outfit anywhere. 35. 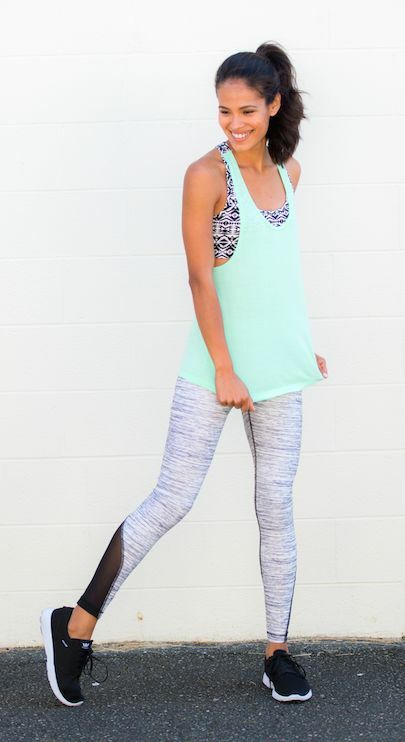 Black running shoes, printed sports bra, and a loose tank top. 36. The essence of black and Nike right here. Sports bra and shorts. Add a watch to add flavor. 37. Get a pair of joggers here. Orange Nike shoes, and a white sports bra. 37 of the best running outfits for women.